Overcast – Legal podcasts are a popular way to keep up with the latest in legal technology. Overcast is free for the basic version, but the $5 version is particularly productive. It removes the spaces between words and accelerates speed. Adriana Linares, @AdrianaL, especially likes that with Overcast you can send a colleague a link to a specific episode of a podcast. Scannable by Evernote – An easy way to scan docs and business cards. Email docs or save to several apps including Evernote. Free. Recommended by Tom Mighell, @TomMighell. Automatic App – This app provides data from your car, including mileage driven and service reminders. Joe Bahgat, @j0eybagodonuts, recommends it as it makes tracking business usage of your car a breeze. $99.95 for the adapter which plugs into your car’s diagnostic port. There were 56 more apps, including Headspace, for mindfulness/meditation, and the Sonos speaker controller. Jeff Richardson will post them all this week on his blog, iPhoneJD. Mobile Helix made two major announcements. We released the new version of our mobile app for lawyers, LINK 2.0. LINK 2.0 integrates with WorkSite/FileSite and NetDocuments so that lawyers can securely access their docs and email them to clients and colleagues from smartphones and tablets. 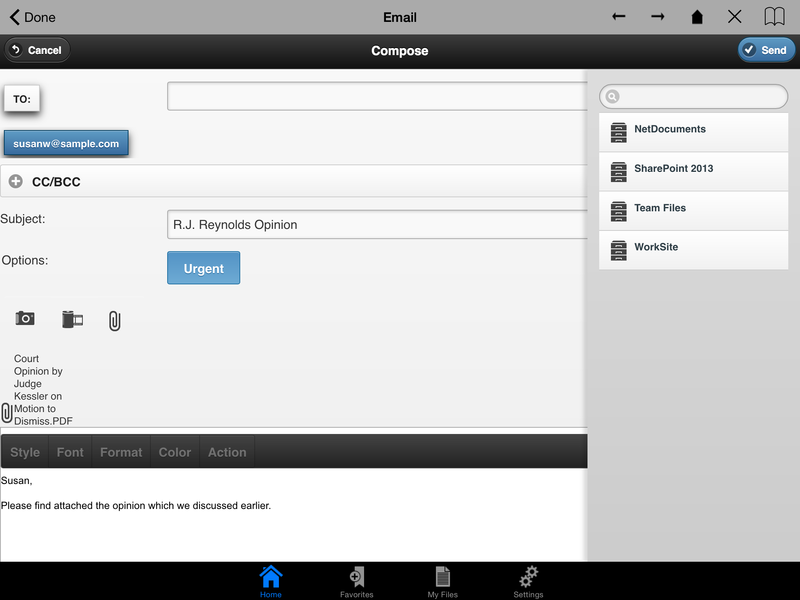 With LINK, when you send a colleague a doc which is stored in WorkSite she will receive a viewable .nrl attachment. Two terrific new features, doc editing and file to WorkSite/FileSite will be released later this quarter. NetDocuments announced their new Apps Marketplace at ABA TECHSHOW. We are thrilled to be one of their partners. Using their APIs we integrated LINK with NetDocuments so that NetDocuments users can access their docs, Outlook, SharePoint, and other apps from one secure app, LINK, without having to sign-on to each app. LINK’s efficient integration makes it easy to draft an Outlook email, attach a doc stored in NetDocuments, and send it to a client from your smartphone or tablet. You can test drive LINK for free. Download LINK from the App Store here and follow the directions to “Take a Test Drive.” Try composing an email and attaching a file from SharePoint. If you have a NetDocuments account you can login into NetDocuments from the LINK app and access your own docs in LINK. Take LINK for a drive. We would love to know what you think! This entry was posted in Events, Mobile Industry News and tagged ABA TECHSHOW, iOS, iPad, iPhone, LINK, NetDocuments by Maureen. Bookmark the permalink.